Theodore Roosevelt visited Newcastle and spoke to the community in 1903. He arrived via train. The Antlers, downtown Newcastle, is the community’s oldest business. The Antlers, originally the Kilpatrick Brothers & Collins Commissary, remains standing in downtown Newcastle. The Commissary was Newcastle’s first business. Today its operated as a restaurant. Historic buildings, including a 1950s era movie theater and a courthouse that is over a century old, line Main Street Newcastle. You won’t find box stores here, but hard working Americans living out their dream to own a business along a thriving main street. Whether you’re looking for a cup of locally brewed coffee, perusing antiques, or looking for a little western clothing, you’ll find it along Main Street in Newcastle, Wyo. Each will be delivered by a hard working entrepreneur with an eye on the American Dream. Newcastle’s first business, built as Wyoming was earning statehood, was the Kilpatrick Brothers and Collins Commissary. 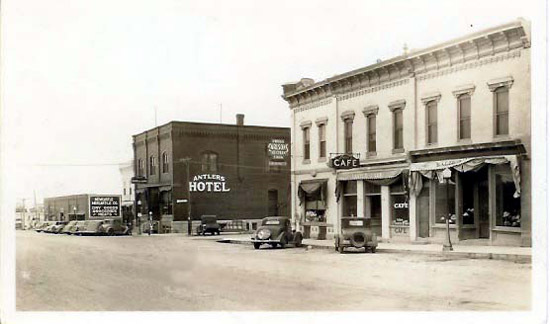 The building later became known as The Antlers, a restaurant and hotel. During the battle of Wounded Knee in 1890 in neighboring South Dakota, The Antlers was fortified and stocked with ammunition in case there was a need to protect local citizens. Bags of flour filled the windows and a ladder was erected to access the roof. 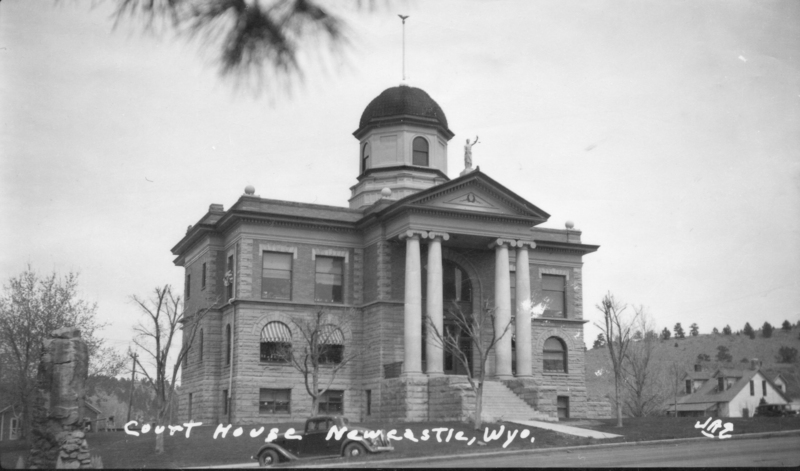 The Weston County Courthouse, constructed in 1910 and 1911, is the focal point of downtown Newcastle. True to the community’s conservative values, the historic building remains in use. The first contractor to work on the building was fired and replaced with John L. Sundstrom, Oscan Linden, Carl Sjostrum and Robert Linden. Despite the set-backs, the men finished the building in time for U.S. President William Howard Taft to visit in October of 1911. The courthouse was added to the National Register of Historic Places in 2001. President Theodore Roosevelt’s visit to downtown Newcastle, on April 25, 1903, took place before the historic courthouse was constructed. 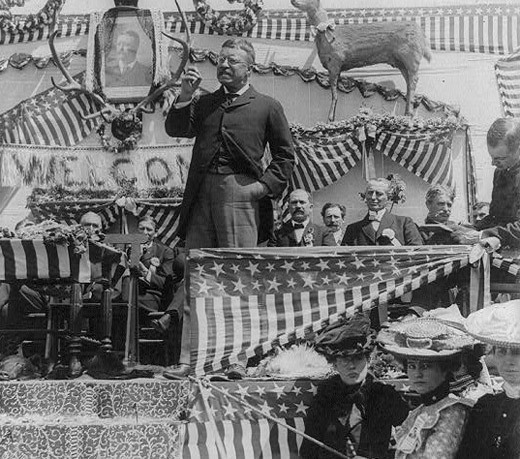 Roosevelt spoke to a crowd of nearly 2,000 as part of an eight-week, 262-speech tour of the West. He spoke from a platform at the local railroad depot, still standing at the edge of downtown. According to WyomingHistory.org, he “was cheered by locals and flag-waving children as he walked a flower-strewn path from his train to a platform. He spoke for half an hour, thanking Wyoming’s congressional delegation for its support, detailing the recent federal irrigation law, and advocating good citizenship and common sense.” The platform was decorated in American colors and included a deer, a bear and an eagle. Both the Weston County Courthouse, located in downtown Newcastle, and the U.S. Post Office that stands across the street, are listed on the National Historic Register. President Theodore Roosevelt received a warm welcome when his train pulled into Newcastle on April 25, 1903.Roosevelt spoke from a lavishly decorated platform at the historic depot that still stands near downtown Newcastle. Walk through downtown Newcastle today and numerous signs of its historic past, and potential future, can still be seen!